In a sauce pan over medium-high heat, melt the butter and then stir in the flour. Cook, while stirring, for about 2 minutes. Whisk in about 1/3 of the milk and whisk until thoroughly combined. Add the remaining milk and bring to a boil, whisking often to avoid scorching. Once to a boil, remove from the heat and add in the chesses and salt and whish until combined. Combine the pasta and the sauce while the pasta is still warm, mix well. In a sauté pan over medium heat, render the bacon crisp. Once crispy, add the garlic and sauté until just beginning to brown. Add the oregano, stir for a few seconds and then add the peas and salt and sauté until warm. 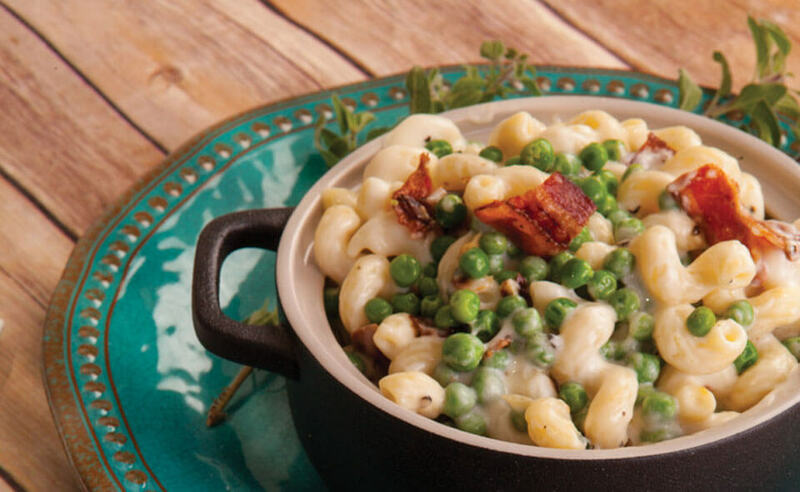 Toss the peas and bacon into the mac and cheese and serve while still warm.